Brooklyn and New York City welcomed players, fans and celebrities into the Barclays Center and Madison Square Garden for a terrific NBA All-Star weekend. As the West flew by the East in a huge game, and competitions elsewhere turned many-an-eye, it was a weekend to remember. Here, review all of the action including a full report for the All-Star game. New York Knicks player Carmelo Anthony and ESPN Radio hosts Mike Golic and Mike Greenberg coached the teams. The final score would was a 57-51 win for the West. Kevin Hart East player would go on to win his fourth MVP Award in a row, he would then announce his retirement from the annual Celebrity All-Star Game. Kevin Hart comes alive at all-star weekend. All Star Saturday night took place on the 14th and per usual it was the night to show off the players skills. The Degree Shooting Stars Challenge had Miami Heats Chris Bosh's Team win. Bosh made his first half court attempt to give his team the best time of 30.2 seconds. Houston Rockets Patrick Beverley would win the Taco Bell Skills Challenge in a great comeback victory. Golden State Warriors player Stephen Curry would shine in the 3 Point Contest with an incredible score of 27. Minnesota Timberwolves player Zach Lavine would shine in the Slam Dunk Contest with a huge backwards dun which gave him a final score of 49. LeBron would start of the first quarter strong with 4 points from two 2 assists from John Wall within the first minute of the game. Harden would bounce back for the West though delivering two three pointers, one being a 25 foot jumper and the other being a 26. Carmelo was struggling early on missing his first few shots and two them being three pointers. LeBron would bring life back into 3 point range for the East though midway through the quarter with two big shots from downtown! Stephen Curry would answer back though delivering a 24 foot three point jumper scoring his first points in the game. Near the end of the first quarter OKC'S Russell Westbrook would make his presence felt giving the West 10 points of his own to close out the quarter! The first quarter ended with The West leading by 11 at 47-36. Westbrook would kick of the second quarter where he left things of in the 1st, Westbrook delivered three huge 2 pointers two being 27 foot long shots. Westbrook sure was fighting for that MVP Award. The East were trailing in double digits throughout most of the quarter but nearing the five minute mark on the game clock a comeback was in play. John Paul would score five points one being a three pointer getting the East up to 75-66. LeBron would make a layup with an assist of from Kyle Lowry which would lead to a West Timeout. Then in the final minute LeBron would draw a foul which gave James three free throws. LeBron made all three followed up by a three pointer by Irving thus ending the quarter and the West were now leading by 1 at 83-82. Westbrook rises to the occasion. Pop sensation Ariana Grande would be the Halftime Performer giving us performances from here hit singles such as 'Problem' and 'Break Free', also we got a surprise appearance of from hip-hop start Nicki Minaj as she appeared along side Ariana in the hit song 'Bang Bang'! 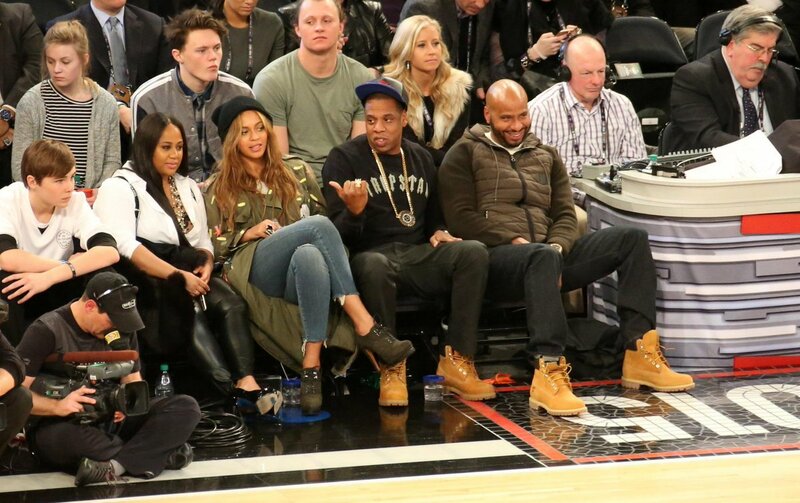 Other starts attended this years NBA All-Star Game such as famous undefeated boxer Floyd Mayweather and R&B Artist Rihanna and Rapper Jay Z and his wife superstar Beyonce. Kyle Lowry and Klay Thompson would exchange three pointers each and then once again it was back to a close game at 99-96. Nearing the end of the quarter Kevin Durant would score his first three points with an assist of fellow OKC team-mate Russell Westbrook. Korver would give the East its last points of the quarter closing the quarter at a draw at 122-122. Miami Heats Chris Bosh would score the first points in the 4th quarter with a dunk of Millsap and for the first time since the early goings of the 1st quarter the East had the lead. The first few minutes would remain relatively even until Westbrook scored a three pointer at 8:26 getting the West up to 135-132. After another timeout Bosh and James would both get three pointers each to overtake the West until Cousins, Paul and Duncan all came back with a layup from Cousins and Paul and a dunk from Duncan. Then in the last few minutes of the game Westbrook and Harden both delivered three pointers each getting the West back up to an eight point lead, but in the last minute of the game Anthony would fire back with a three pointer of his own and Gasol made a layup in the last 0.02 seconds which got the score to 161-158 and the West took a timeout! With 0.01 left Westbrook drawed the foul in which he scored his two free throws which closed out the game. The West won the 2015 NBA All-Star Game. Final score 163-158. Then shortly after the game Russell Westbrook was awarded with the 2015 NBA All-Star Game MVP Award. It was very well deserved as he gave an incredible perfomance and now holds the record for the second most amount of points scored in an All-Star Game with an incredible 41 points. 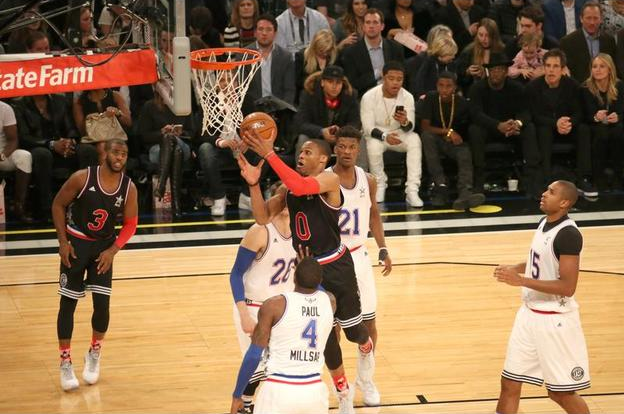 This years NBA All-Star Game was also the highest ever combined point score in history. 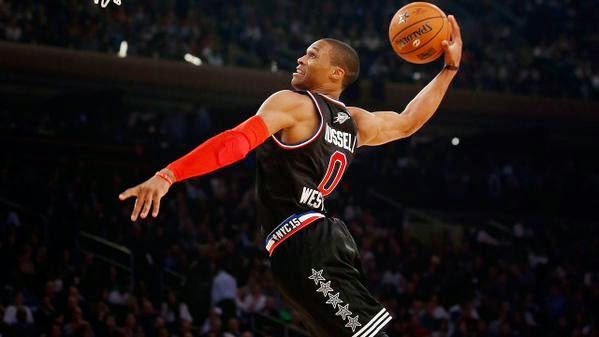 Full recap from the 2015 NBA All-Star weekend.